Leslie also authored The Indian Meal Book (Philadelphia, 1847). According to Longone, this book was actually first published in London, its goal being “to introduce and teach the Irish how to use cornmeal as a staple to survive the great potato famine.” From what I’ve read the Irish did not much like cornmeal, but it was widely consumed in North America, where settlers had been taught how to cook the grain by Native Americans (thus the term “Indian” in this and many other cornmeal recipes). Sift a pint of fine yellow Indian meal, and half a pint of wheat flour, and mix them well together. Prepare a nutmeg beaten, and mixed with a table-spoonful of powdered cinnamon. Stir together till very light, half a pound of powdered white sugar; and half a pound of fresh butter; adding the spice, with a glass of white wine, and a glass of brandy. Having beaten eight eggs as light as possible, stir them into the butter and sugar, a little at a time, in turn with the meal. Give the whole a hard stirring at the last; put it into a well-buttered tin pan, and bake it about two hours. Leslie’s recipes were notable for their detail — she used “tablespoons” instead of “spoonfuls,” for example, and gave more directions than was customary at the time, although I don’t understand what “prepare a nutmeg beaten” means. I could probably have muddled through her recipe, however, but decided to go with Richard Sax’s version from Classic Home Desserts, since he did such a wonderful updating, fairly true to the original. Sax added a little baking powder to improve the texture, and he increased the proportion of white flour to cornmeal. Perhaps he was trying to avoid what Leslie herself warned about: “This cake (like everything else in which Indian meal is an ingredient) should be eaten quite fresh; it is then very nice. When stale (even a day old), it becomes dry and rough as if made with saw-dust.” Yikes! I love Leslie’s straightforwardness, though. Sax’s pound cake is also best the first day, but it’s good the next as well. Slightly sweet and spicy and with a little crunch from the cornmeal, it tastes delicious on its own or with butter or jam. 1. Preheat the oven to 350°F. Butter and flour two 9″ X 5″-inch loaf pans. Sift the cornmeal, flour, baking powder, cinnamon, nutmeg, and salt into a bowl and set aside. 2. Using an electric mixer (or beating by hand), beat the butter on medium-high speed until light. Add the brown and white sugars and lemon zest and beat until very light. Add the eggs, one at a time, beating well after each addition. Then add the milk and brandy and blend. With the mixer at low speed, beat in the dry ingredients just until combined. 3. 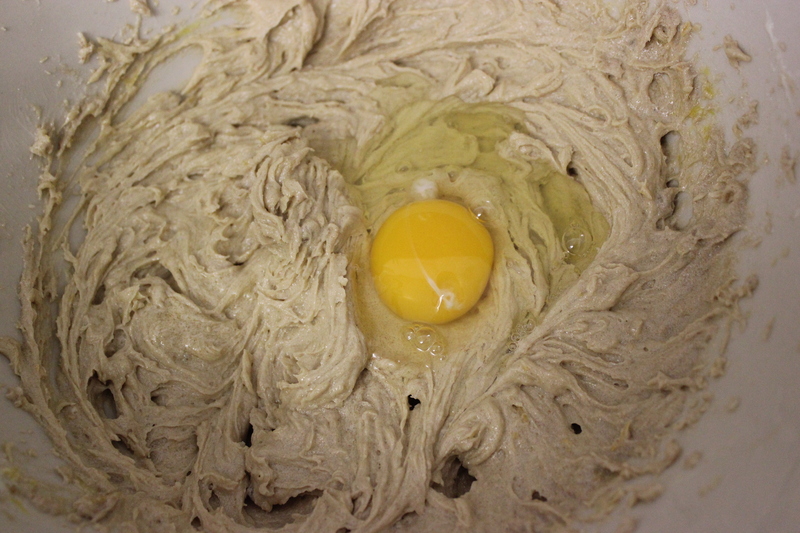 Divide the batter between the two pans. Bake until golden and a toothpick inserted near the center comes out clean, about 45-50 minutes. Cool the cakes in the pans on a wire rack for 15 minutes, then remove from pans. Serve at room temperature. *Rhode Island johnnycake meal is a white cornmeal that can be ordered from Gray’s Grist Mill or Kenyon’s Grist Mill. 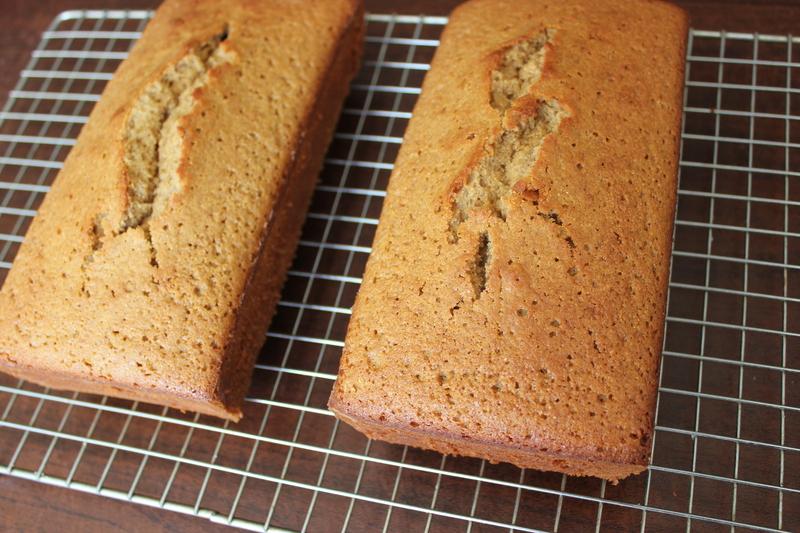 I used regular stone-ground yellow cornmeal, which worked fine. This entry was posted in cake, dessert and tagged 19th century food, Cooking, cornmeal, Eliza Leslie, food history, johnnycake meal, Pound cake, richard sax by revolutionarypie. Bookmark the permalink. 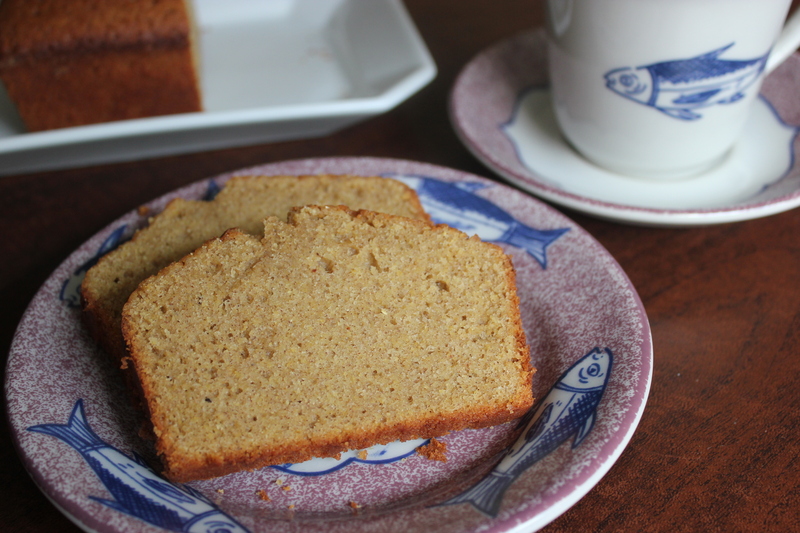 I LOVE Indian Pound cake with its delicious flavor combinations and texture. Goes great with coffee or tea for breakfast, and equally as delicious as a dessert. I usually use Greg Patent’s version from Baking In America – also based on Mrs. Goodfellow’s original recipe. 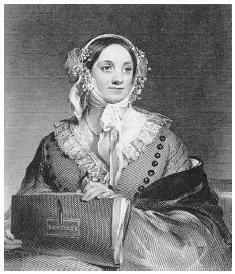 Both she and Eliza Leslie were fascinating ground-breaking women – we have much to thank them for! Thanks for visiting, Becky. I had wondered whether Leslie’s recipe was based on Mrs. Goodfellow’s — good to know. I see you’ve written a biography of Mrs. Goodfellow and will try to read it soon. Thanks also for mentioning Patent’s book as that looks great as well. I am keen to try the recipe. I love the texture of cornmeal. I use it often in muffins. There’s a great recipe from Moosewood Restaurant for raspberry cornmeal muffins which I cook a lot. I’m not familiar with white cornmeal – can you enlighten me? White cornmeal is made from white corn. Some say it’s less sweet than yellow cornmeal, but they can basically be used interchangeably in recipes. The white variety is more common in the southern U.S., and in Rhode Island. Johnnycake is a type of stone-ground (versus steel-ground) white cornmeal. More of the hull and germ are left in stone-ground cornmeal, and it’s felt to have a “cornier” taste. Hope this is helpful, Inga! Note to self: Don’t read this blog whilst hungry. The cake looks and sounds delicious – great post! This is a very interesting piece. Beyond Simmons, there seems to be a void in the record of early American cookery. While American cuisine was largely influenced by European cooking traditions, one often has to extrapolate backward from early 19th century cookbooks as well as delve into personal journals and other non-cookbook sources of the time to understand the distinctive “Yankee” ingredients and dishes such as this one. You’ve done a great job of doing just that! This sort of research causes me to wonder what other 18th century American dishes were “lost” in the assumptions of historians simply because their recipes weren’t published until the 19th century (pandowdy, for instance). Thank you very much, Karen! Glad you enjoyed it, Kevin. You put it well about extrapolating backward. I often start a post thinking the history of a dish will be straightforward, but it rarely is! I wish you lived here in Ipswich – I think your tasty recipes and talents would fit so perfectly into our historic setting. Need better fare here. Thanks, Holly. I wish I lived there, too! Indian Pound cake sounds so great. I love all this food history! I was thinking about your blog, this weekend because we were in Gettysburg soaking up a little history. I picked up one of those little paper cook books that had Northern Ladies recipes in it. It’s pretty cool and I can’t wait to try them out. The cakes look awesome.They also had a recipe book with Slave cooking, the beginning of soul food. I didn’t get it, but I kind of wish I had. I’d love to hear how the Northern Ladies recipes turn out.